Hello everyone! 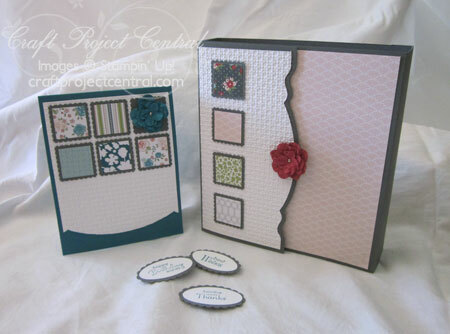 Here are the two final projects for the August edition of Craft Project Central! This unique and beautiful box is sure to impress! The sizeable box will hold lots of little treats or small gifts. Change up the papers for any occasion or add a handle to the sides to make a special basket! The accompanying card coordinates purrrrfectly!! This interesting project was created by Kim! If you have a chance please head on over to Craft Project Central and leave Kim a comment on her project! This pretty project was created by Kris! If you have a chance please head on over to Craft Project Central and leave Kris a comment on her project! To get the instructions for Kris’ project just subscribe to August and meet one of the bonus project requirements of subscribing to two or more months in a row, putting the Craft Project Central badge on your blog, or referring a friend and when they subscribe, letting us know! If you would like to subscribe to the August edition of Craft Project Central and get 10 wonderful tutorials for just $10.00 then click HERE!